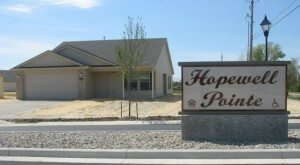 In 2012, Brightpoint and Keller Development, Inc., completed Hopewell Pointe, a community of 35 single-family homes made available to low- and moderate-income families. All homes at Hopewell Pointe are lease-purchase properties, with residents having the opportunity to buy their homes at the end of a 15-year period ending in 2027. Hopewell Pointe consists of three- and four-bedroom homes in a quiet neighborhood setting in the Waynedale community of Fort Wayne. Residents benefit from a community center, playground, access to amenities such as shopping, and on-site opportunities for financial-literacy and homebuyer education, and seasonal home maintenance workshops.